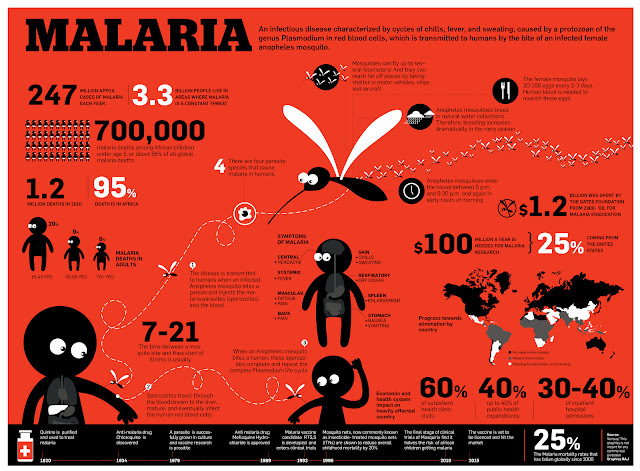 Mind Blowing Malaria Facts & Figures you must see -INFOGRAPHIC. Malaria is one topic that we can't afford not to educate you about, as a gossip blog originating from the Sub-Saharan region of Africa. With recent knowledge of how disease vectors/carriers can migrate across continents, you certainly agree with me that no knowledge is useless. I bet you didn't know that mosquitos can travel in aircrafts . Study the infographic below for facts and figures that will make you vow never to tolerate another bite from a female anopheline or any other mosquito at that. Having this knowledge in our kitty cat, what have we as people done to contain this menace. Very hilarious @Ogbiaclinic. Fleeting is necessary ooo. Malaria is a super killer for non-immune populations you know.